Well, it would be a good idea to know what we're dealing with first. Now, I am far from being a financial expert (bit of an understatement :P), so I shall use layman's terms. In essence, a stock (also known as a share) is a little piece of the company; if you purchase stocks (it is normal to buy more than one; you usually buy several thousand at a time), then you own a percentage of the company you have invested your money in. It will only be an extremely small amount though, probably not even 1%. Why on earth would I want to do that though? Say, for example, you decided to purchase a stock in a new company for $1. Over time, that company might increase dramatically in value as they earn more money, until that stock which you originally only paid $1 for is now worth $5 if you sold it on the Stock Market. Obviously, if you owned several thousand of these stocks, you would be looking at a very large profit. 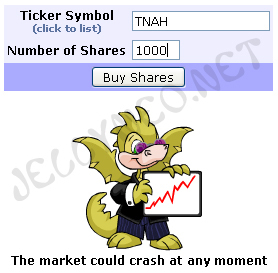 Indeed, this is why a lot of Neopians champion the Stock Market as a means of making Neopoints. Wait a minute! What on earth is a portfolio and why would I want it to be black? A portfolio is just a fancy name for a listing of all the stocks you currently own. And if something is described as being "in the black," then it just means that it is financially stable. The opposite would be if they were "in the red," meaning that they were in financial difficulty and probably owe money or are on the verge of being declared bankrupt. Right, so what will you need to start with? I would recommend that you have about 100,000 Neopoints or so at your disposal to begin with as it can take a while to generate any profit and in the meantime, you may need some funds to restock with as well. 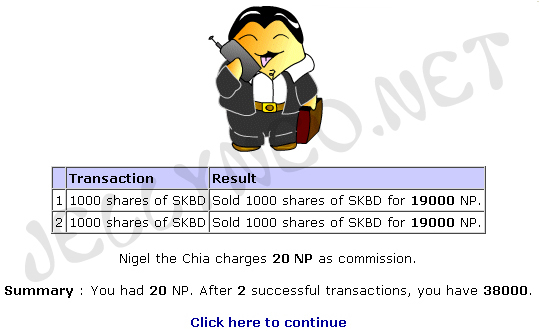 When you visit the Stock Market, you will be greeted by Nigel the Chia again, who will try to wow you with his flashy gadgets and his boast of owning the only car in Neopia. Don't let him fool you though, he has absolutely no clue what he's talking about when it comes to stocks. That little random event where he suggested investing in a particular company was just a stab in the dark, he has no insider knowledge. The home page of the Stock Market itself can look rather intimidating; the marque at the top with the letters and the numbers in different colours means nothing to you right now so just ignore it, you can also go ahead and ignore the Find Stocks, News/Research and Profile links as well. In fact, ignore all of the links there and instead go to this one. This is a list of the cheapest stocks in Neopia at the moment. I would bookmark this link as it is very useful but a bit of a pain to find. Alternatively, use your Jellyneo Dailies Service to remind yourself to visit there each day. Instead of live updates like the real stock market, the Neopian Stock Market traditionally updates every half hour, at :08 and :38 minutes past the hour. (Times current as of May 10, 2018. They may shift over time.) Not all stocks will have a price change at each update, however. Each day at 4pm NST the stocks will reset and all of their daily trending information will start over at 0, and instead begin recording trending information for the next day. The first thing to mention is that you are only allowed to buy shares that are currently trading for 15NP or more each. When choosing a stock to purchase, the rule of thumb is "buy low, sell high," so it is best to only pick stocks trading for 15NP as that is the cheapest you can possibly purchase. However, if you choose the Cheaper by the Dozen boon from the battleground, you may purchase stocks that cost 10NP or more! It doesn't really matter which company you choose to invest in. 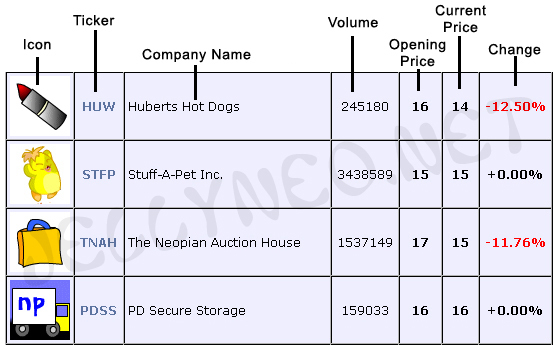 Years ago, the Stock Market was actually influenced by how well certain Neopian businesses did; for example, Hubert's Hot Dog stocks went up and down in value depending on how many items the shop of the same name sold. However, this led to pockets of users grouping together and buying out entire shops to inflate the value of their stocks, so The Neopets Team put a stop to that. It is a good thing, really, since certain companies (such as Lupe Consolidated) don't have a representative store in Neopia and their stock prices would never have changed. Right, enough with the history lesson, what do you say we get your portfolio off the ground? Scroll down the list of stocks on the bargain list (the one you come to when you clicked the link above) and find the first company whose shares are trading for 15NP. Icon - each company has a little picture of what category it belongs to; this doesn't really mean anything, it's just a way of differentiating between companies. Ticker - each company goes by a 2 to 4 letter ticker (or 5 in the single case of EEEEE); think of it as a nickname. Company Name - self-explanatory. You can find a complete list of companies here. Volume - this is a running total of the number of that stock which has been bought and sold that day. Opening Price - how many Neopoints each stock was worth when trading opened that morning at 12:00am NST. Current Price - how many Neopoints the stock is currently selling for. Change - a percentage total of how much the price of that stock has changed during the day. A green number indicates an increase, a red number indicates a decrease. Which is just a fancy way of saying "don't put all your eggs in one basket." From time to time, a company will go bankrupt and you will lose any money you invested in that company (fortunately, it is quite rare that this happens), so it is better to have 10,000 stocks at Company A and 10,000 stocks at Company B rather than clumping them altogether in one company. This is what I meant when I said earlier that your existing portfolio would influence your choice of stocks; say, for example, that you already had 3,000 stocks in The Neopian Auction House. Then it would make sense to buy stocks in Stuff-A-Pet Inc. to balance things out a bit. Once you have bought your stocks, there isn't really anything else for you to do but to wait for them to increase until you are happy with the profit margin. It is a good idea to check your portfolio at least once a day (or more often if a particular stock is doing particularly well and you are considering selling). Here is an overview of the portfolio screen and what it all means. Sell - clicking on this little triangle opens up the option to sell those stocks, I'll get to this part later. Icon - same as before. Ticker - same as before. Opening Price - same as before. Current Price - same as before. Change - same as before. Quantity - how many of that type of stock you currently own. Worth - how much your stocks would be worth if you sold them right now. Change - how much the stock has fluctuated since you purchased them. As before, green indicates an increase and red indicates a decrease. You will want to pay particular attention to the last column as ultimately this will determine whether or not you want to sell your stocks. How long you wait is entirely up to you, though I would recommend waiting until you get a 100% or more increase on your original investment before selling. It's a good idea to set yourself a cut-off point and stick to it. If you would rather have the Neopoints as quickly as possible then you might decide to sell off stocks once they reach a 50% increase, or even lower if you are really impatient. :P The only "wrong" time to sell is when your stocks are in the red, so you would be making a loss. It may seem like the best option to cut your losses and sell up before you lose even more money but hang in there, in time they will slowly start to rise again. When your stocks reach that "magic number" and you want to sell them, it's time to pay Nigel the Chia a visit (yes, I'm afraid you have to, if his hairpiece freaks you out that much just try not to look at it). On the portfolio page, click the little triangle to the left of the icon on the stocks you want to sell. You will then get a little drop down menu asking you how much of the quantity you want to cash in. Each batch of stocks you bought will be grouped separately, along with the individual prices of each set when you bought them (in case you bought some priced at 15NP and some priced at 30NP or something, but you're not going to do that now, are you? :P) and the respective increase/decrease in value. You can choose to sell all of them at once but some people prefer to hold back a hundred or so, just in case the value suddenly rockets up; they don't want to take the risk with large amounts of Neopoints but don't mind risking a few thousand. Yet again, it is entirely up to you how many or how few you choose to sell and when you choose to sell them. However, in order to sell your stocks, you have to pay Nigel a handling fee of 20NP. He isn't a ruthless business man, however, and you can sell as many batches of stock as you like from as many different companies as you like at the same time and he will only charge you the single fee of 20NP. Certain factions give the opportunity of activating the Cheaper by the Dozen boon if you side with them and they emerge victorious from the Battleground of the Obelisk. This boon allows you to purchase stocks that are selling for 10NP per share as opposed to the usual 15NP restriction, meaning that you make even more profit when selling them later. There now, that wasn't so bad, was it? :D I will leave you with just a quick recap of the key points to remember when playing the Stock Market, and wish you good luck in your investments!